VietJet Air is planning to add three new domestic and three new international routes in the coming months as Vietnam’s leading low-cost carrier continues to pursue rapid expansion. VietJet has already surpassed rival LCC Jetstar Pacific to become Vietnam’s second largest carrier after Vietnam Airlines with approximately a 15% share of the country’s fast-growing domestic market. The privately-owned carrier will see its share of capacity in Vietnam’s domestic market approach 20% by mid-2013 – an impressive achievement given it only launched services in Dec-2011. VietJet now operates 10 routes, including one international route, with a fleet of six A320s. It plans to operate by the end of 2013 a fleet of 10 A320s on 16 routes – 12 domestic and four international. VietJet vice president of business development Dinh Viet Phuong stated at the CAPA Finance Asia Summit in Singapore on 20-Mar-2013 that the carrier has selected Ho Chi Minh-Singapore as its second international route. The carrier’s tentative network plan for 2013 also includes Ho Chi Minh-Taipei and Bangkok-Hanoi. The latter is poised to become VietJet’s first international route from the capital Hanoi and supplement its Ho Chi Minh-Bangkok service, which launched on 10-Feb-2013 with one daily flight. Mr Dinh told CAPA that VietJet aims to launch service to Singapore in Jun-2013. VietJet will become the fourth LCC to serve Ho Chi-Minh- Singapore, which is the largest international route from Vietnam with over 30,000 weekly return seats. The route is currently served by Singapore-based LCCs Jetstar Asia and Tiger Airways along with Indonesian LCC Lion Air, Singapore Airlines (SIA) and Vietnam Airlines. Jetstar Asia now serves the market with three daily A320 flights while Tiger operates 17 weekly A320 frequencies, which will expand to 21 frequencies in May-2013. SIA and Vietnam Airlines each serve the route with two daily flights each, with SIA using 777s and Vietnam Airlines using A321s. Lion offers one daily 737-900ER frequency as part of a Jakarta-Singapore-Ho Chi Minh routing. Tiger at one point in 2011 and early 2012 operated four daily frequencies to Ho Chi Minh while Jetstar also operated a fourth flight during some days of the week. But both carriers reduced capacity to Ho Chi Minh in early 2012, resulting in about a 15% drop in total capacity and returning the market to more rationale levels. 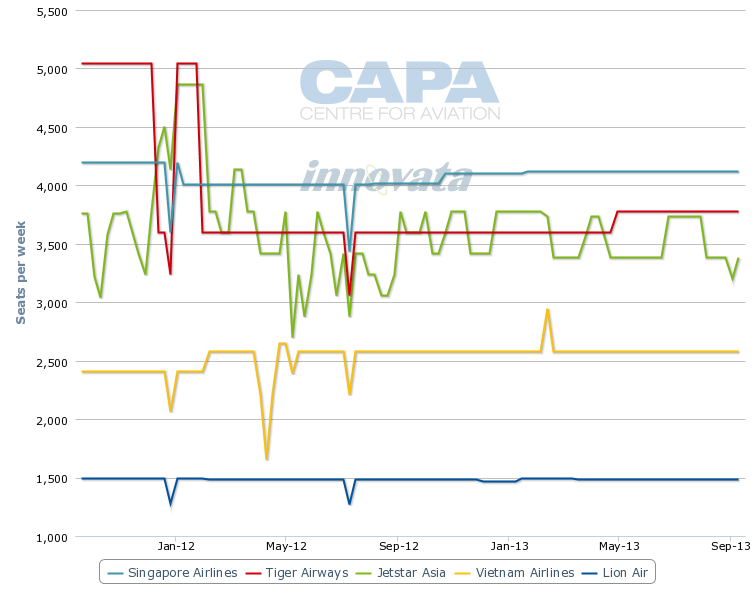 With VietJet entering, there is a risk the market could return to an over-capacity situation along with unprofitability as the four LCCs serving the market engage in fare wars. Entering such an intensely competitive market could be challenging given the large amount of capacity from the incumbents. But Mr Dinh is confident VietJet can leverage its strength in the local Vietnamese market, where it has quickly built up a strong brand. Ho Chi Minh-Singapore is primarily a Vietnamese outbound market consisting of a mix of business and leisure travellers as well as migrant workers. While Tiger and Jetstar Asia have the advantage of operating the route for several years, VietJet has a stronger local distribution network. Tiger in particular lacks local distribution options in Vietnam while Jetstar also relies heavily on online sales although can leverage the presence of sister carrier Jetstar Pacific in selling in Vietnam. Competing with Singapore Airlines and Vietnam Airlines is not as much of a factor for VietJet as the carrier will significantly undercut their fares and appeal to the price-conscious traveller. But conversely the two full-service carriers could be impacted as a fourth LCC enters the market. SIA, which has already seen the performance of its Ho Chi Minh route degrade in recent years as a result of significant increases in LCC capacity, may ultimately have to hand one or both of its flights to regional subsidiary SilkAir. SIA for now has a leading 27% share of capacity in the market. VietJet has no fear of taking on more established foreign LCCs as it already competes with AirAsia in the Ho Chi Minh-Bangkok market. Bangkok is the second largest international destination from Ho Chi Minh. In addition to Thai AirAsia, the Ho Chi Minh-Bangkok market is served by Thai Airways, Vietnam Airlines, Turkish Airlines and Lufthansa. The Hanoi-Bangkok route is currently served by Thai Airways, Vietnam Airlines, Thai AirAsia and Qatar Airways. Bangkok is the largest destination from Hanoi with almost 21,000 weekly return seats (includes both Bangkok airports). Ho Chi Minh-Taipei is a logical route for VietJet as it is the largest international market from Vietnam that is not yet served by an LCC. 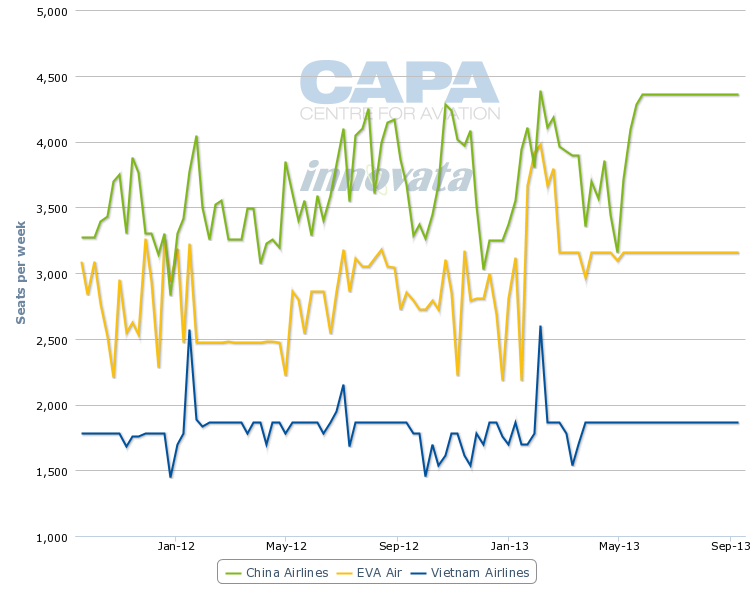 The route is now served by China Airlines (CAL), EVA Air and Vietnam Airlines. Vietnam Airlines has only one daily flight in the market, compared to typically two daily flights for CAL and 10 weekly flights for EVA. Taiwan is the largest market in Asia without a local low-cost carrier. VietJet should help stimulate demand by introducing low fares, duplicating the impact seen in other international markets from Taiwan as foreign LCCs have entered. But Ho Chi Minh-Taipei is more an inbound market than VietJet’s other initial international routes, which could pose a challenge for VietJet given its brand has little to no recognition outside Vietnam. While VietJet has not yet set launch dates for Ho Chi Minh to Singapore and Taipei or Hanoi to Bangkok, it has said it plans to have four international routes by the end of 2013 and has identified these routes in its network map. VietJet also has said it plans to have 12 domestic routes by the end of 2013. VietJet already operates nine domestic routes and has identified two more in its network map – Ho Chi Minh-Buon Ma Thuot and Hanoi-Nha Trang. These two routes were announced on 25-Mar-2013 and tickets sales have already begun for flights starting 20-May-2013 and 01-Jun-2013, respectively. VietJet’s booking engines shows Ho Chi Minh-Buon Ma Thuot will be operated with one daily flight operating year-round while Hanoi-Nha Trang will be operated with two daily seasonal flights from 01-Jun-2013 to 02-Sep-2013. VietJet has not yet identified its 14th and final domestic route for 2013. But it most likely will be a route linking two existing destinations such as Hanoi to Buon Ma Thuot, Dalat or Phu Quoc. These destinations for now are only served by VietJet from Ho Chi Minh. For the peak summer 2013 season, VietJet will have six domestic routes from its Ho Chi Minh base and four from Hanoi. A seventh domestic route from Ho Chi Minh has to be suspended due to repairs at the Hue airport. The selection of Buon Ma Thuot as VietJet’s 10th domestic destination comes less than two weeks after Jetstar Pacific announced Buon Ma Thuot as its seventh domestic destination. The dual announcements highlight the intensifying competition between the two carriers. Jetstar Pacific on 14-March announced plans to launch service to Buon Ma Thuot from 26-Mar-2013. Jetstar’s booking engine shows the carrier is initially operating five weekly flights to Buon Ma Thuot from Ho Chi Minh and three weekly flights to Buon Ma Thuot from Vinh. VietJet will have slightly more capacity on Ho Chi Minh-Buon Ma Thuot, with one daily flight when it launches the route on 20-May-2013, but is not planning to operate Vinh-Buon Ma Thuot. Vietnam Airlines currently serves Buon Ma Thuot from Ho Chi Minh with five daily flights, three using ATR 72s and two using A321s, according to Innovata data. Vietnam Airlines also operates one daily A321 flight to Buon Ma Thuot from Hanoi and one daily ATR 72 flight from Da Nang. Air Mekong also operated the Ho Chi Minh-Buon Ma Thuot route until the Vietnamese regional carrier suspended operations on 28-Feb-2013. 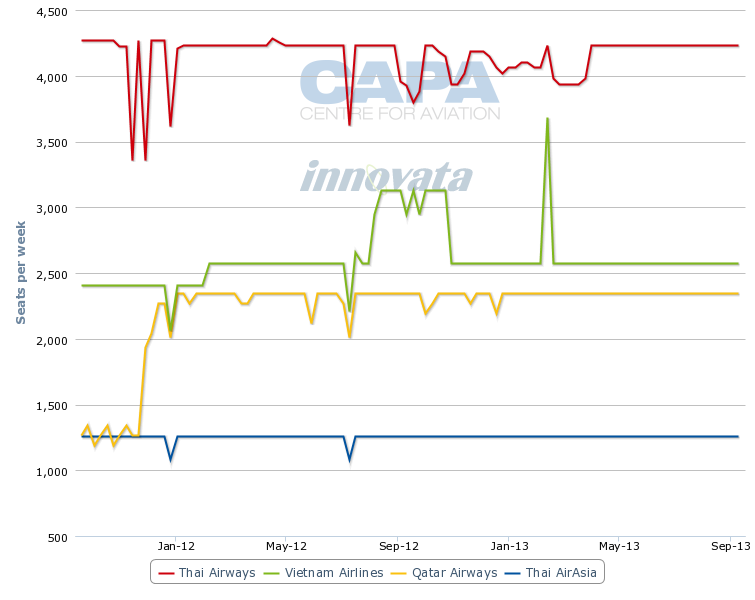 Air Mekong had served Ho Chi Minh-Buon Ma Thuot with between seven and 14 weekly Bombardier CRJ900 frequencies depending on the time of year, according to Innovata data. The carrier’s exit left an opening for an LCC. Prior to Jetstar Pacific’s entry, Ho Chi Minh-Buon Ma Thuot was the 12th largest domestic market in Vietnam based on seat capacity. It is no surprise Ho Chi Minh-Buon Ma Thuot has become a target for both Jetstar Pacific and VietJet as it is the second largest route in Vietnam not yet penetrated by LCCs. Only Hanoi-Can Tho was slightly larger (smaller once factoring in Jetstar Pacific’s new flights in the Ho Chi Minh-Buon Ma Thuot market). Buon Ma Thuot is located in Vietnam’s central highlands and is known as the coffee capital of Vietnam. Buon Ma Thuot is the ninth largest airport in Vietnam, based on current capacity, which makes it the largest destination not already served by VietJet. Buon Ma Thuot along with the mountain town of Dalat are popular retreats for Vietnamese looking to escape the heat of Ho Chi Minh City. Jetstar’s booking engine also shows that Jetstar Pacific plans to resume seasonal service from Hanoi to Nha Trang, a popular beach town in south central Vietnam, on 01-Jun-2013. Jetstar Pacific will operate one daily flight on the route through 31-August. VietJet’s booking engine indicates that Hanoi-Nha Trang will be served with two daily flights from 01-Jun-2013 to 02-Sep-2013. Vietnam Airlines currently serves the route with three daily flights and plans to add a fourth daily frequency for the peak summer season, according to Innovata data. Nha Trang is a highly seasonal destination, drawing large numbers of Vietnamese tourists during the summer months. But VietJet has served Nha Trang year round from Ho Chi Minh since it entered the market in May-2012, operating between one and two daily flights depending on the time of year. Within its 25-Mar-2013 announcement, VietJet said it will again double capacity between Ho Chi Minh and Nha Trang for the 2013 peak summer season, with a second daily frequency operating from 20-May-2013 to 31-Aug-2013. VietJet also said it plans to operate a second daily season frequency from Ho Chi Minh to Haiphong, Phu Quoc and Vinh from 20-May-2013 to 31-Aug-2013. Note: route is in order of launch. ^Some extra flights from VietJet to Dalat are expected during peak summer season but number has not been specified. The upcoming new domestic routes and capacity increases will give VietJet 27 domestic flights on 10 routes for the peak summer season, compared to 19 and eight respectively for Jetstar Pacific. VietJet currently accounts for about 15% of seat capacity in Vietnam’s domestic market, compared to 14% for Jetstar Pacific and 71% for Vietnam Airlines, according CAPA estimates. VietJet’s share of domestic capacity will increase to an estimated 19% during the peak summer season month of Jul-2013, compared to 67% for Vietnam Airlines and 14% for Jetstar Pacific. Jetstar Pacific currently operates a fleet of five A320s compared to six A320s for VietJet. While VietJet is committed to adding at least four leased aircraft during the remainder of 2013, Jetstar Pacific has not yet committed to acquiring additional aircraft. Jetstar Pacific has said it plans to have a fleet of 15 A320s within “the next few years” but has not yet secured leases on any additional aircraft. The Jetstar Group recognises it needs to accelerate expansion in Vietnam to keep up and potentially close the gap with its bigger faster-growing rival. As a result, Jetstar Pacific is now looking at leasing additional A320s for delivery in 2013 (it is not looking at sourcing aircraft from the Jetstar Group’s existing orders). But it is unlikely it will add more than a couple of aircraft, meaning it will likely end the year about 5ppt behind VietJet in market share. Jetstar Pacific’s fleet and network has not expanded in recent years as the carrier has instead been focused on replacing 737-400s with A320s and improving profitability. Jetstar Pacific retired its last 737-400 in Jan-2013. After a tumultuous initial five years, Jetstar Pacific began a new chapter in early 2012 when a majority 70% stake was transferred within the Vietnamese Government to Vietnam Airlines. The Jetstar Group, which is part of Australia's Qantas, owns the remaining 30%. VietJet’s rapid ascent over the last year has alarm bells ringing at the Jetstar Group as well as at Vietnam Airlines. There will almost certainly be a strong response although it has been slow so far to materialise – likely because expansion at Jetstar Pacific needs to go through several layers of government approvals as it remains majority government-owned. Jetstar Pacific should finally announce fleet and further network expansion over the next several months. But Jetstar Pacific will struggle to catch up with VietJet. The carrier, which has been operating under the Jetstar Pacific brand and following the LCC model since dropping its prior Pacific Airlines brand in 2007, has lost its first mover advantage and nearly five-year head start over VietJet. Mr Dinh says VietJet plans to lease a fleet of up to 20 A320s in 180-seat single class configuration by the end of 2015. It is committed to adding at least four aircraft in 2013, three in 2014 and three in 2015. But expansion could be accelerated to include five to six additional A320s per year. VietJet has already carried over one million passengers and operated over 5,000 flights. Its average load factor to date has been nearly 90%, highlighting the appetite for low fares in Vietnam’s domestic market. Assuming it maintains load factors of nearly 90%, Vietjet will carry over 2.8 million passengers in 2013. The carrier is planning 3.2 million seats in 2013, an increase of 327% over the 976,000 seats it offered in 2012. As Vietnam’s only surviving private carrier, VietJet has an advantage in that it can move quickly to exploit opportunities in the fast-growing Vietnamese market. Regional carrier Air Mekong was the second private carrier in Vietnam to shut down in just over three years. Another private carrier, Indochina Airlines, suspended operations in late 2009. Their failures show the challenges start-ups face in Vietnam, including an unfavourable regulatory environment with restrictions such as fare caps and an unlevel playing field in having to compete against a powerful government-owned entity. But Air Mekong and Indochina were both full-service carriers. Vietnam’s market continues to have huge untapped potential, particularly for low-cost carriers which can stimulate demand and tap into the country’s growing middle class. But for the short and medium term, market conditions, particularly in the domestic market, could become ugly. Routes such as Ho Chi Minh-Buon Ma Thuot may struggle to sustain two LCCs. Competition will further intensify as VietJet continues to expand rapidly and Jetstar Pacific finally starts to pursue expansion after a long hiatus. The few markets where VietJet only competes with Vietnam Airlines, such as Dalat, Hue and Phu Quoc, will inevitably see Jetstar Pacific entering. With a limited number of viable domestic routes, there is a risk of over-capacity. Ho Chi Minh-Hanoi is the only large trunk route in Vietnam and is already served by eight daily flights from both Jetstar Pacific and VietJet. The Ho Chi Minh-Hanoi market currently accounts for 38% of total seat capacity at VietJet and about 45% at Jetstar Pacific. VietJet already serves the 10 largest destinations in Vietnam (includes Hue, where services are currently temporarily suspended due to runway repairs). Most of the country’s other markets are too small to support frequent service with 180-seat aircraft, even with low fare penetration. VietJet and Jetstar Pacific will both need to turn to the international market but competition there will also be intense – between Vietnamese carriers and with foreign airlines, particularly larger and stronger LCCs. VietJet has grown impressively in its first year, illustrating the potential of Vietnam’s LCC market. It also has proven that affiliation with a large LCC group is not necessary to be successful. But charting out a patch for sustained profitability and outlasting an extended period of increased competition with Jetstar Pacific and Jetstar Pacific majority owner Vietnam Airlines will not be easy.